The Best Allergies and Carpet Cleaning Service in Mill Creek,Wa. The Best Allergies and Carpet Cleaning Service in Mill Creek, WA. Allergies And Carpet Cleaning:For your home carpet to remain safe and perfectly protected, you need a cleaning service that works. People who are allergic to pollen, dust and dirt may find it difficult to exist in a poor environment. When your home carpet remains dirty, there is every possibility for allergic members in a house to fall sick. Poor carpet cleaning process in your home can lead to spending extra money on allergy medications. This will never do you any good. All Star Carpet Cleaning service is always here to assist your allergic members. We use different carpet cleaning tools to handle customers commercial and residential needs. Even if you do not have any idea on the entire process, we are always ready to help. Our service comes with the best quality that anyone can always depend on. We have qualified experts who are willing to unleash their expertise to your urgent needs.Allergies and attack from the carpet may increase the chronic health condition of your family. It is better to give us a call today. All Star Carpet Cleaning service is prepared to render the best allergies and carpet cleaning service in Mill Creek, WA. That will change your health condition effectively. There is no peer to our carpet cleaning service in the whole industry. This is because we are always serious in the way we handle customer issues. Our cutting edge equipment cannot be compared with other services. We have all it takes to give your home carpet the best solution. Our service remains the best that anyone can always rely on, over and over again. 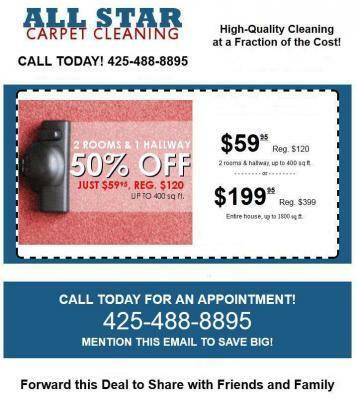 We even offer affordable carpet cleaning service to our loved customers. You can give us a call for the best solution today. We will be happy to help your carpet cleaning needs.